RWBY: how did I go so long without watching this? So, sometimes I’m a slacker when it comes to pop culture – especially TV and movies. I’ll hear about a new show or movie that’s particularly awesome, and say “oh, I should watch that!” (Which is what I’ve been saying about Guardians of the Galaxy for so long that there’s a sequel to watch now. Oops.) Then, my brain files that information away somewhere to be forgotten about for months or years, until I’m reminded of it again, and realize that I’ve been meaning to watch it forever. Like RWBY. I’d seen people referencing it online years ago, and talking about how good it was, and I saw merchandise for the show in Hot Topic (yes, I shop at Hot Topic sometimes, it’s a guilty pleasure of mine despite how pricey everything is in there), and said “oh, that looks kinda cool, I should watch that someday.” Well, that someday finally came – a couple of weeks ago, in fact. Holy crap, why did I wait so long to watch this show? It’s hilarious and badass and awesome, all at the same time. It’s like Final Fantasy meets the Blue Rose tabletop RPG I’m playing in (where all the characters are essentially learning how to become guardians of the realm at a special academy, grouped into squads, and the GM hadn’t ever seen RWBY until we were four or five games in, so it’s eerie as heck how the game parallels the show). It has sneaky references to fairy tales and other stories, and I love how subtly it’s all worked into the story. And one of the first things I noticed, having watched a fair amount of Red vs. Blue back in the day, was the Rooster Teeth feel to it all, especially in season 1. I spent a lot of time excitedly flailing as I watched season 1 of RWBY, as I’d see familiar joke timings, or epic battle scenes that make me think of Final Fantasy 7’s Limit Breaks, or even just cute goofy stuff that made me happy. I love this show. I seriously love this show. How can you not enjoy a show where every melee weapon is also a gun? Like this set of nunchucks, which not only can turn into a staff, but are also freaking SHOTGUNS. The soundtrack is great, the animation keeps getting better with every season, and the storyline is engaging. And I’m only a few episodes into season 2 at this point. I’m quite sure this weekend is going to be spent binge-watching the rest of the show while I recover from my LARPing adventures last weekend. (I have to remind myself that I’m not exactly as young as I used to be, and running around in the forest for two days will leave me hurting if I’m not careful, hah.) And, to be honest, trying to convince myself not to try to throw together a Ruby cosplay for Gen Con, hahah. 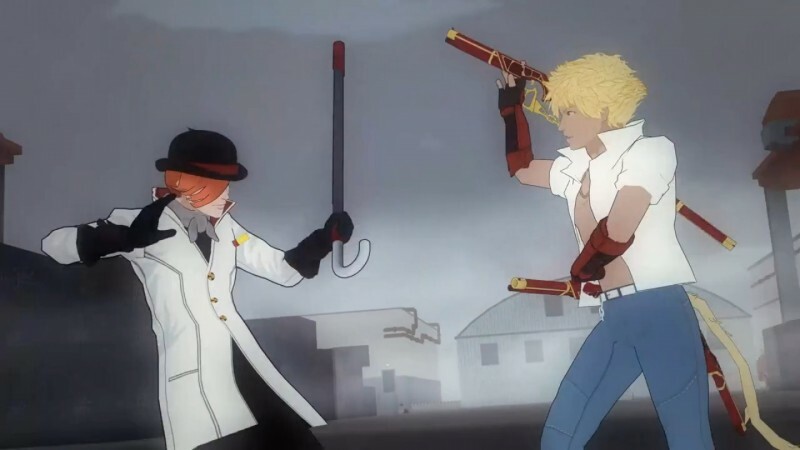 Whenever I do finish RWBY, I’ll come back and post a more thorough review of the show, something more substantial than my fangirl flailings of today’s post. So far, though, I’m enjoying the heck out of this show.